Chicken Marsala…for weeknight cooking? Yes! Tonight Kev is sick so I decided to force him to rest and make dinner myself. 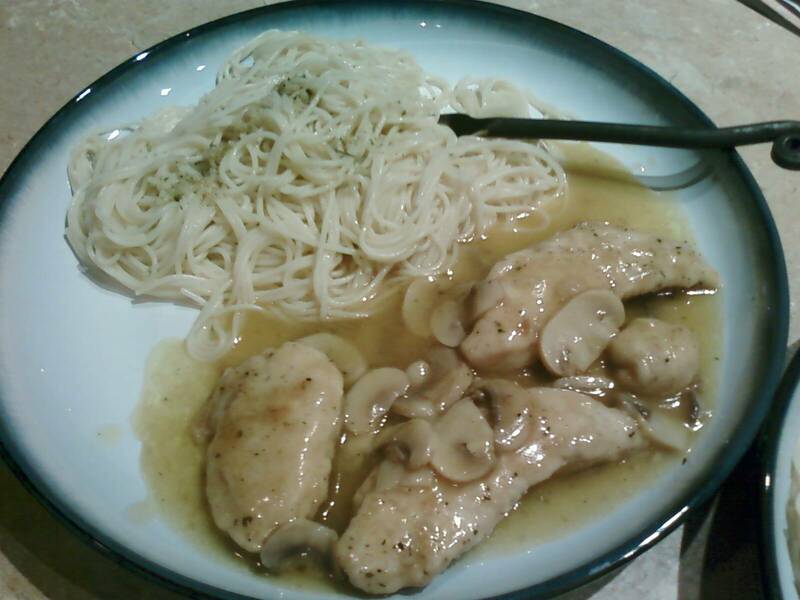 I’ve been wanting to make Chicken Marsala for a while and didn’t realize how simple it actually was. It always looks so fancy! I started cooking about 6:20 and we ate about 7:15. Not too bad for the first time I’ve every made something, if you ask me! It would probably look a lot nicer on the plate if you added some asparagus or a sprig of parsley, but we didn’t have either. Oh well, how it looks isn’t the most important thing for Thursday night dinner. Basically, roll your chicken (I had 6 tenders) in this flour mixture: 1/8 cup flour, 1/4 tsp salt, 1/4 tsp black pepper, 1/4 tsp oregano (or more if you like it a lot). In a large skillet melt 4 Tbsp butter in 4 Tbsp olive oil. Lightly brown one side of the chicken in the oil. Flip the chicken and add about 1 cup sliced mushrooms (fresh makes all the difference), 1/2 cup marsala wine and 1/4 cup cooking sherry. Put a lid on your skillet and let the mixture simmer for 10 minutes, turning the chicken half way through. That’s it! You have chicken marsala. How easy is that? Because chicken seems pretty sad by itself I cooked up some angel hair pasta and dressed with my made up pasta sauce: a few Tbsp olive oil, 1 Tbsp butter, 3 cloves of pressed garlic, 1 tsp parsley. Toss the pasta in the sauce and then add some freshly grated parmesan to the top. Yum. This is the recipe I followed, although not exactly. Instead of pounding chicken breasts thin I just used chicken tenders. Either way apparently works because this dish was really tasty! I really love the gravy-like smooth and creamy consistency. Categories: Baking, Cooking, Delectable Dabbling, Food, Savory | Permalink.